It is cold. No, it is really cold. A sub-zero cold with flurries blowing around in such a way that no matter the direction snow gets in the eyes and mouth. On top of which there is a tube strike. I should be gloomy. I should be heading home for an early night with warming cocoa (laced with rum, naturally) in a toasty warm environment. In fact, I should question my sanity in going out at all, but I have been invited to a tasting of the new harvest olive oil by Andre Dang and I am childishly excited. Why? Well the venue, Valentina’s, is a glistening glass building that, with the Christmas lights and gleaming decorations, looks like a veritable box of delights. Added to that, the quirkiness of a Vespa in one window, and the two snow white Fiat 500s (one, an original and coveted by me) sitting outside. I am, in my superficial way, already in love. As I walk in dressed like a knitted yeti, my eyes are (naturally) drawn beyond the food based gifts towards the wines sitting temptingly along a wall. The wine selection has been carefully chosen by Fabio (a member of the family that owns and runs Valentina’s) and having recognised a few labels I am almost tempted to go on a mad spending spree. 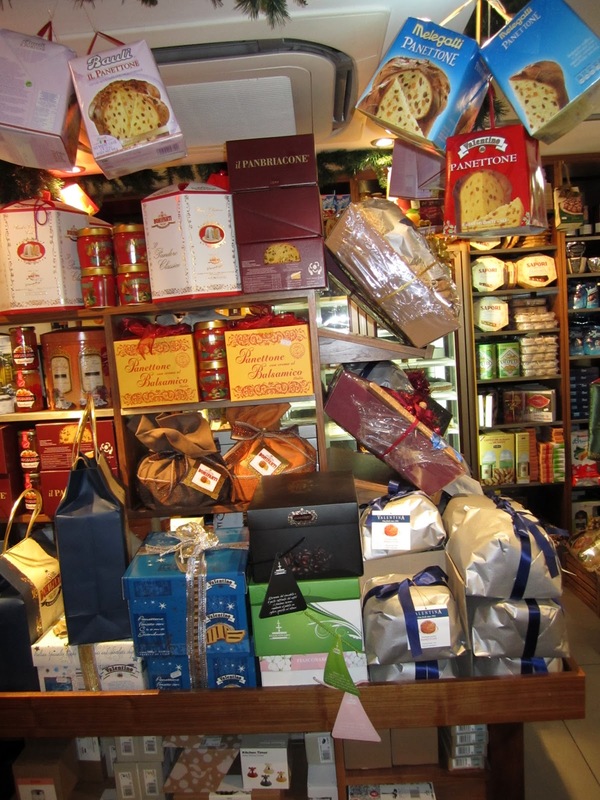 They have an excellent selection of wine hampers to take the buyer on an individual oeno-tour of Italy, central, north and south, as well as the individual bottles on sale on line as well (I checked earlier online). The delicatessen, with its selection of imported cheeses, meats and trattoria delicacies that is the heart of the business. 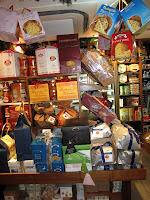 Bags of pasta, Barilla and Di Cecco (Matthew Fort of the Guardian in his book, Eating Up Italy says that these are not only the biggest producers but most Italians consider them better than other rivals such as Bertorelli), Alessi designs and Olive wood gifts. But we are here for the olive oil, the theme of the evening. To be exact, new harvest, first pressed olive oil from the farms around the foothills of Montecassino where the owners’ family are from and to be used in each savoury course. Unfiltered, luminescent green, cloudy oil. Herbaceous in flavour, with an instant grassy hit, lightly bitter and strongly peppery. It would have been enough just to lap it up with plain bread. So, we sit to plates of Parmesan and olives. Big, juicy and fruity, olives that bring out the cheese’s creaminess. And indeed the cheese is creamy and moreish. 24 month matured Parmesan cheese broken onto the plate in small chunks with a slightly grainy, good saline and acid balance, mild in flavour. 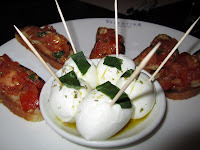 The meal itself started with bruschetta and mozzarella appetisers. The bruschetta, simple and elegant: chopped tomatoes, and basil, topping a garlic rubbed crunchy crusted fresh bread with subtle hints of garlic, light, zingy and pleasurable. The mozzarella were in a bowl on the side. Small brilliant white balls sitting in a small pool of forest green oil; ping-pong sized and milky rich with a slight and very mild almost cottage cheese sourness; tangy and just elastically resistant to the bite. A plate of shellfish arrives, scallops to be exact. Visually looking so good it was a shame to eat it. 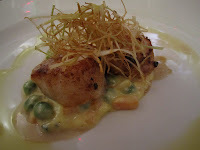 Seared scallops with golden tinged edges and translucent centre, covered in a crispy straw nest of shredded leeks, and sat on a bed of reduced cream and wine, peas and carrots in a Russian Salad array of colour, all drizzled with the new harvest olive oil. The scallops gave easily under the knife. Light hints of fish, wine and some citrus cut through the cream, breaking down the richness and flipping the tongue from peppery oil to sweeter cream to light seafood flavours making the diner feel addictively greedy for more. No surprise therefore that this is one of the top selling dishes. 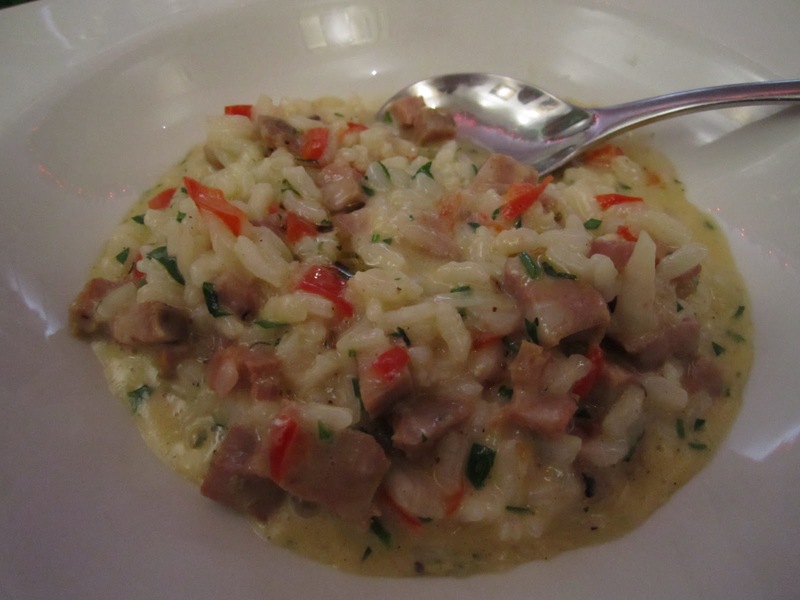 Next a Sausage Risotto. An ocular feast of colour, tutti frutti colours of red pepper, parsley and the pinky fleshy sausage colour mixed with the whiteness of the Arborio rice and yellow sauce. Topped on this was a spoon filled with the olive oil to drizzle over the dish. Lemon acidity and tongue coating eggy creaminess of the stock (was egg used to help thicken and enrich it? ), the fennel aromas of the sausage, hung for at least a day and soft and spongy to the bite, perfectly done. The nutty resistance of the Arborio rice, sweetened by the contrast and the peppery herbaceous edge of the oil helped in part by the pepper of the parsley. I am deliciously stuffed. But wait! There is pudding. Pear poached in red wine with ice cream and a snow flurry of icing covering the plate, highly appropriate given the drop in temperature and the impending bad weather. The odd physallis and raspberry for garnish add to the continued theme of mixed colours. 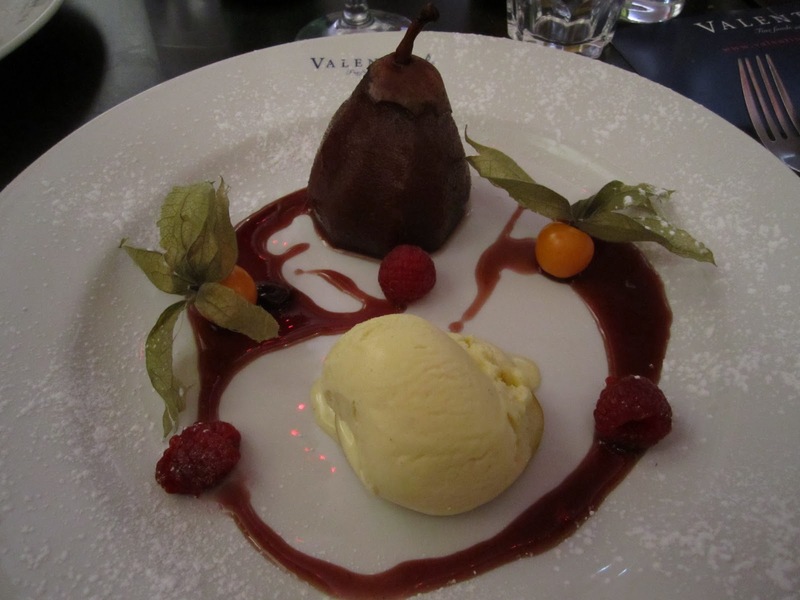 The pear’s grainy texture smoothed by a syrupy berry wine sauce and a swirl of the melting vanilla. Served hot, (not cold as I am used to) which, to me, helps bring out the sauce’s full flavours. Syrupy berry wine sauce, mixed with a creamy vanilla and the subtlest of subtle hints of chocolate that is melted into the sauce, giving it a smoky, richer and slightly cinnamon tinge. 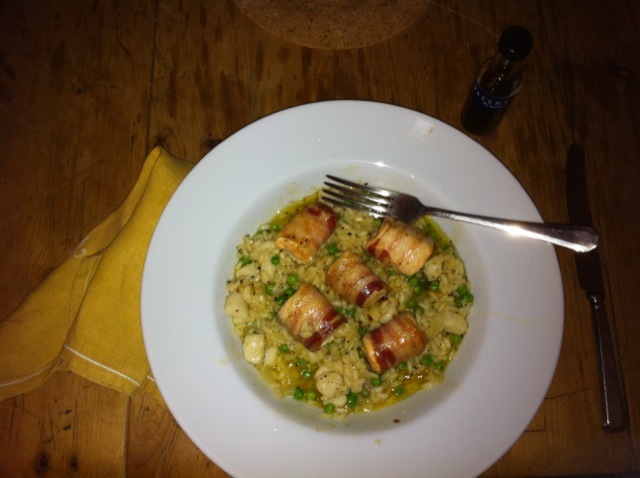 With the meal I had a glass of the Verdicchio, Castel di Jesi 2009 (Yes, I had just the one!) Light on the nose with floral notes, vanilla creaminess contrasts with the crisp, lemon juice and lemon pith and flinty minerality, for balance. At Valentina’s, detail is the key, subtle points that hint to real care, no, real love about what is being served and how it is served. I thoroughly enjoyed the invitation to Valentina’s and would recommend a visit, not only for the culinary experience but to feast your eyes on the wines, gifts and delicatessen foods that greet the visitor at the entrance. As an aside: in the spirit of using this olive oil for my own ends and following the example given to me by Valentina’s, I made a salmon and scallop risotto (sadly all the herbs were frozen in the garden so I ended up using, ironically, frozen peas for a bit of green colour) finally drizzling a spoonful of Valentina’s ‘green gold’ for flourish to give pepper to the sweetness. Photo's with grateful thanks to May of the blog Slowfoodkitchen because I am a technophobe with my own phone! Valentina's, 75 Upper Richmond Road, London SW15 2SR. http://www.valentinafinefood.com/ 020 8877 9906. That was a lovely meal with some lovely people.